Pulling an all-nighter remains one of the most basic forms of collegiate street cred. But sleep deprivation is becoming an epidemic with serious implications for all Americans, not just caffeine-fueled undergraduates. "This is a very serious health problem," according to Mark Quinn, chairman of the Better Sleep Council, the consumer education arm of the International Sleep Products Association. 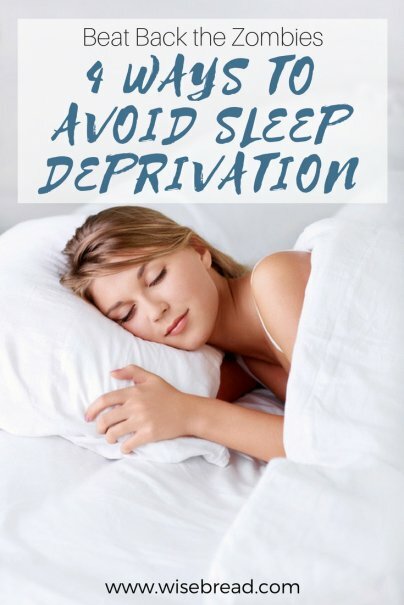 "Sleep deprivation can have a profound impact on a person's general health as well as his or her mood, energy level, job performance, and overall productivity." The Better Sleep Council is launching a new public awareness campaign to help curb sleep deprivation. The "Stop Zombieitis" campaign takes a tongue-in-cheek approach, equating sleep-deprived Americans with, well, zombies. Despite the lighthearted tone, the campaign aims to spotlight and tackle the array of debilitating effects of sleep deprivation, from diminished productivity and body pains to impaired driving and unsafe work conditions. The campaign kicks off this May, which is Better Sleep Month. This month is a great time to get your sleep back on track. If you aren't getting seven to eight hours of sleep a night, try using the suggestions below. The older the mattress, the less likely you are to get a good night's sleep. Only 9% of Americans who own 8- to 10-year-old mattresses get seven to eight hours of sleep, according to the ISPA. Of the 53% who get those coveted seven to eight hours, a big chunk — 36 percent — have a mattress that's one to four years old. An Oklahoma State University study showed similar results — study participants reported significant improvements in sleep quality, lower back pain, and comfort when sleeping on a new mattress. A good mattress isn't cheap, but it's one of those key investments that pays for itself in peace of mind. The Mayo Clinic recommends that people establish and stick with a sleep pattern. Wake up and go to bed right around the same time every day of the week (yes, that includes weekends). Getting into a solid regimen can help your body's sleep-wake cycle and, over time, tends to make both waking and falling asleep easier. This one is increasingly difficult in the age of Kindles, iPads, and ubiquitous electronic devices. But recent studies suggest that prolonged use of electronic media before bed leads to insufficient or poor-quality sleep. Walk away from the light, not toward it, in the hour or so before it's time for bed. There's an increasingly clear correlation between exercise and better sleep. But it also depends on when you exercise. An afternoon workout can help you fall asleep faster and sleep sounder, but exercising right before bed can actually do the opposite, according to The National Sleep Foundation. A 2003 study of morning exercise among postmenopausal women showed similar results. Other than the mattress solution, these steps require little to no financial outlay. Consider creating a "new bed fund" as soon as possible, then keep it rolling once you purchase that sleek new model. Don't be a zombie. Your body will thank you. Hmm... The "Better Sleep Council" is supported by the mattress industry and recommends everyone buy a new mattress to sleep better.